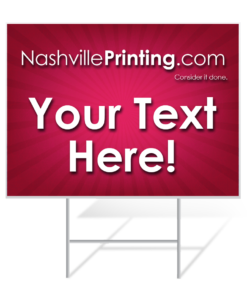 Confidently display your message with a reusable Nashville Printing yard sign.Signs are made from ultra durable Coroplast to provide a rugged outdoor sign that can be used time and time again. These signs are an inexpensive, completely customizable advertising option that can be turned around in just a matter of days. 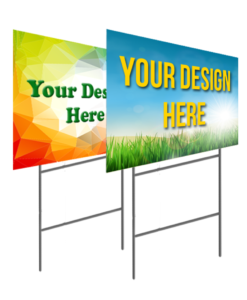 Our yard signs come with either an H frame or spider stakes to ensure easy installation that will last. Take comfort in knowing that Nashville Printing provides a 100% satisfaction guarantee. If you don’t love your sign because of something on our end, we will replace or refund your order. For churches, schools and other eligible non-profits, ask how you can get 10% of your order back as a cash donation, pursuant to our Nashville Printing Give-Back Campaign as an added “thank you” to these community groups who allow us to do their printing.